How you got involved in your sport: A spur of the moment move to Calgary, AB in 2009 led me into an opportunity to dry land train with some of Canada Skeleton’s Winter Olympians. That helped me begin to understand a sport that had been entirely foreign in my world. 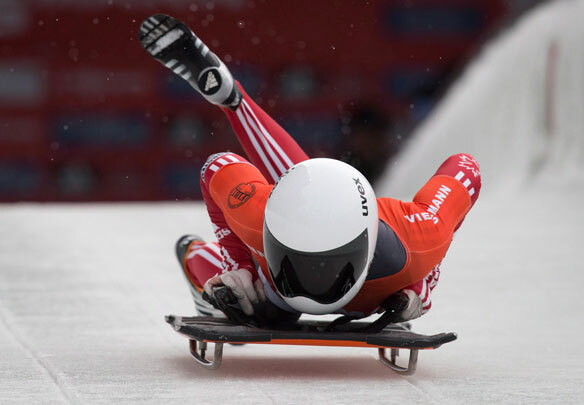 In October of 2009 I completed the Calgary Skeleton Driving School -and loved it … and in February 2010 had tickets to stand trackside for both the men’s and women’s races for the Vancouver Olympics – I was officially hooked; my flame was lit. CAN Fund Testimonial: Being a CAN Fund recipient means being a part of a family. A family that supports one another to achieve greatness – every step of the way. In my eyes, this does more than just support me financially, it serves as a reminder that our country believes in us, and that without a shadow of a doubt – we can believe in ourselves to achieve greatness. Share one valuable tool that you use on a daily basis that helps you to be the best athlete you can be: Be patient – with your coaches, with your team, with your programming, with your physical transformation, but most of all – be patient with yourself. Who is one person in your life that has impacted your career and what was it that they taught you: Every athlete has a story to tell – heartbreaking, heartwarming, inspiring or motivational – as we travel the world, I never pass up a chance to hear these stories – because not only, do they show me over and over again that we are linked in both diverse and simple ways, but they teach me to remember to always appreciate even the smallest moments along this journey.